Create a classic and romantic portrait for all of your favorite couples with myDaVinci's In-Masterpiece series of artworks. For those who love our "American Gothic" and "Adam and Eve", you might love this romantic artwork too. 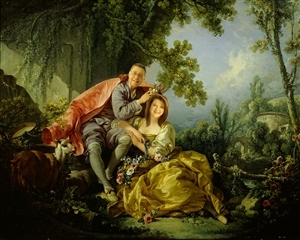 Based on your photo(s), our talented graphic artists will seamlessly place the couple into this timeless masterpiece entitled "The Four Seasons: Spring", originally created by French painter François Boucher in 1755. This personalized vintage artwork makes a great gift for all of those couples out there who really enjoy the fine arts together. My parents laughed when they saw their gift and really liked it!